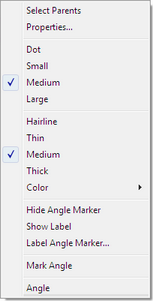 Windows: Right-click in a sketch window, sketch object, tool object, or information balloon. Mac: Hold down the Ctrl key while you click in a sketch window, sketch object, tool object, or information balloon. •The Sketch: Click empty space in the sketch window to change preferences or to use commands that apply to the entire sketch. •A Sketch Object: Click a sketch object to change the object's properties or attributes or to use commands that apply to that object. •A Tool Object: Click a given object or a step in the Script View to change the object's properties or attributes. •An Information Balloon: Click an information balloon to display the object's Properties, to change the size of the balloon's text, or to control whether the balloon displays parents, children, or both. Context menus show only available commands. For information on any of the commands in the Context menu, refer to that specific topic in the Menu Reference. Right-click (or Ctrl-click) empty space in the sketch to change the sketch preferences or to use commands that apply to the entire sketch. When the Context menu for a sketch appears, if there’s room on the screen, the menu appears in such a position that Preferences is directly under the mouse,making it especially easy to choose this command. Right-click (or Ctrl-click) a sketch object to change the object's properties or attributes or to use commands that apply to that object. When the Context menu for a sketch object appears, if there’s room on the screen, the menu appears in such a position that Properties is directly under the mouse, making it especially easy to choose this command. There are several commands that appear only in the Context menu for certain sketch objects; these commands don’t appear in any other menu. Bring to Front and Send to Back allow you to change the layer of layered objects such as pictures, polygons and other interiors, and loci and iterations of these objects. Increase Value and Decrease Value allow you to increase or decrease the value of a parameter. The value changes by the Keyboard Adjustment amount set in Parameter Properties. Increase Resolution and Decrease Resolution allow you to increase or decrease the resolution of a plotted object (a locus, a function plot, a sampled path, or a sampled transformed picture). Increase Iterations and Decrease Iterations allow you to increase or decrease the depth of an iteration. Right-click (or Ctrl-click) a given object or a step in the Script View to change the object's properties or attributes, or to print the script view. Right-click (or Ctrl-click) an information balloon to display the object's Properties, to control whether the balloon displays parents, children, or both, and to change the size of the balloon's text.